Arsenal have of course now moved to the Emirates Stadium but Arsenal Football Club will be forever historically associated with Highbury Stadium. The picture below is taken from a Football Review magazine in the early 70's. "With a limit set at 63,000 Arsenals Highbury ground has one of the largest capacities in the league and seating for 17,500. The record gate at the ground was for a First Division game against Sunderland in March 1935 - 73,295. 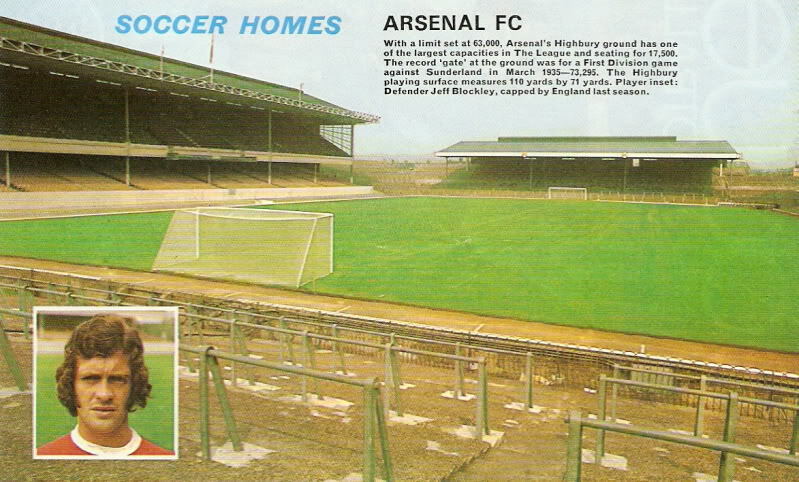 The Highbury playing surface measures 110 yards by 71 yards. Player inset : Defender Jeff Blockley, capped by England last season." I have also found an absolutely stunning piece of old film footage on Google that shows the old Highbury Stadium as it used to be in the 1970s.